Ruminations more than anything else. June is a beautiful and magical time here in the Boonies. 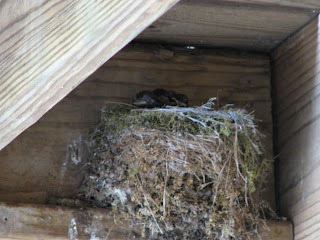 The baby birds are fledging. We’ve had little Phoebes in a nest under the deck again, the hummingbirds always are thirsty and buzz me when I read the comics outside. The wild turkeys kick up our pine straw daily. In the fields, hay is being harvested and the Queen Anne’s Lace sways in warm breezes on the roadsides. We often stop to watch the baby horses and we’re always on the lookout for the hawks and running creeks. To have a girl who is 4.5 seems like a perfect summer thing. There is wonder, color and curiosity in this girl right now. Much like the season she is living. “Why is the sky pink?’’ and “Watch me swim underwater!’’ and off she goes, down under, for the first time ever, when just a few minutes prior she had proclaimed she never, ever, nunca, for real would stick her face in the deep. And, just as the fields and woods outside are dotted with new dress, I now really get why they say a girl “blossoms.’’ I once was a blossoming girl, of course, and I have watched young girls in my family and in others grow up. But, watching one grow by the second: learning words, becoming a champion hula hooper and go from one day resisting dresses to suddenly insisting each and every garment “spin wide!’’ is quite awesome and hilarious. This hearty and sturdy girl, who her father fittingly named “cowgirl,’’ suddenly flits around our house in tiaras, long beads and plastic pink heels with fuzzy feathers. Click, click, click and “watch me dance!’’ is the chorus of our home. Summer allows us to see the mama birds flying back and forth from yard to nest, carrying fat worms and leggy bugs to grow their offspring. All too soon, confidence and beautiful plumage build and off they will go. Mine too one day will go, of course. The Pheobe who returns to the same nest under the deck each season inspires me to believe that my own colorful fledgling will return to hers often. Until then, I will admire the daily blooming.